Manic R&B-flavored garage/punk from Australia. 16 tracks. All 16 tracks released by the band are included on this CD reissue of their sole album, which adds both sides of their two subsequent non-LP singles. 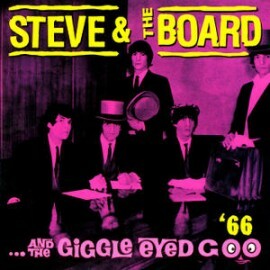 Steve and the Board weren't out of this world, but they were an energetic, slightly above-average British Invasion-inspired band, leaning closer to the Beatles and the Mersey sound than raving R&B. Their biggest Australian hit, "The Giggle Eyed Goo," is actually a bit in the novelty vein and not too representative of most of their repertoire, which was dominated by original material. "I'm to Blame" is a nice, innocuous mating of the Mersey sound and the Byrds, while "Margot" goes more into the harder-charging sounds of mid-'60s mod rock, and "I Want" will probably be favored by garage fans for its high, droning, distorted guitar riff. "I Call My Woman Hinges 'Cause She's Something to Adore" is certainly one of the more oddball song titles of the era, and is like several of their other songs, a respectable midpoint between the R&B and pop wings of the British-influenced sound. The highlight, though, is the brooding, sublimely melodic rockaballad "Lonely Winter," which, incidentally, was recorded by the Bee Gees (with better vocals and a slightly fruitier arrangement) around the same time. There's another Bee Gees connection in a cover of an early Barry Gibb song the Bee Gees never released, "Little Miss Rhythm & Blues," though this slow interpretation is markedly inferior to the fine up-tempo version of the song issued by Trevor Gordon in the mid-'60s. Of the non-LP cuts, "So Why Pretend" is about the best in its sort of Zombies-meets-1965 British beat boom sound, though none of them are that great. Unfortunately, there's virtually nothing in the way of informative liner notes on this expanded re-release, though it has a complete discography.